21-Jan-2004 -- We made a chilly but none-to-early start from Azilal (at 4500 ft/1400 m it was freezing hard overnight). Our preferred route of shared taxis looked unlikely, so Rachel and I bit the bullet and caught a taxi to Souk de Foum Jema`a. The taxi driver was a little confused when we asked to be dropped beyond the town, but as this placed us slightly closer to the Confluence we didn't really care! 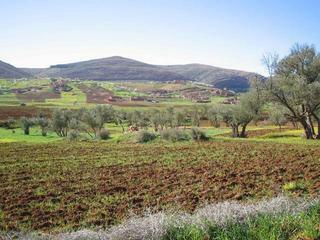 A track led north from Foum Jema`a past almond groves down onto a fertile plain, with the snow covered peaks of the High Atlas in the background. The GPS indicated the Confluence lay on or beyond a spur of hills some 3000 ft/900 m high. We followed a goat track up the lower slopes (dodging sheep and goats as we went). Higher up we lost the track and climbed to the ridge through scrubby carpets of cactus. The view from the top was stunning. The High Atlas range stretched across the southern horizon while the Confluence lay close to the village of Amchebek. A pleasant stroll took us down to the village and a network of paths made finding the exact spot not too tricky. The traditional confluence dancing had the zeroes all lined up! The trip back to Foum Jema`a was a mite more like hard work as the temperature was now more severe and our water bottle was empty-ish. Two Strepsil throat tablets were our only sustenance but an hour and half later we were back in civilisation and ready for the bus back to Azilal. #7: Richard and Rachel in full Islamic mode!